If you are shopping for a new car, and are considering the Ford Mustang, you will want to familiarize yourself with the handling features of this iconic vehicle. One of the key handling features of the Ford Mustang is Selectable Electric Power-Assisted Steering. The steering system is designed both for everyday driving as well as for those times when you want the real feel of a sports car, including a closer connection to the roadway. 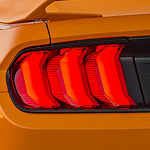 The handling features of the Ford Mustang include abundant stopping power. Even in an emergency situation, the braking system is designed to optimize control and steady deceleration under an array of different situations. If you find that you have questions about any of the Ford Mustang handling features, the professional, experienced team at Ray Price Ford stands ready to assist at any time.